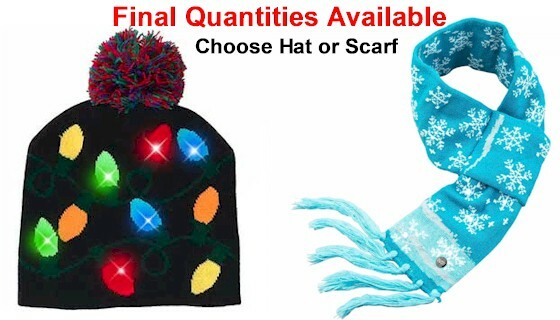 Buy more to save even more... buy more than one of any of the Light Up Winter Accessories to save more! YES you can mix and match. 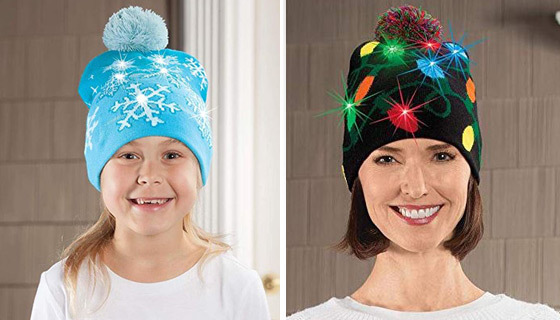 These fun and festive hats and scarves actually light up with the push of a button! 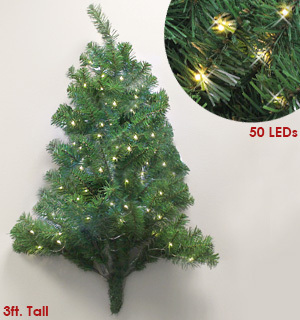 Bright LEDs shine in your choice of design - choose from Festive Light Bulbs or Winter Snowflakes. 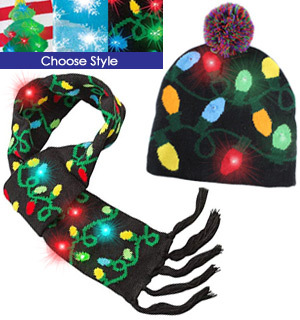 Each hat and scarf has 6 LEDs and three flashing modes that you can cycle through by pressing the on button. Go from fast and moderate flashing, to steady on. 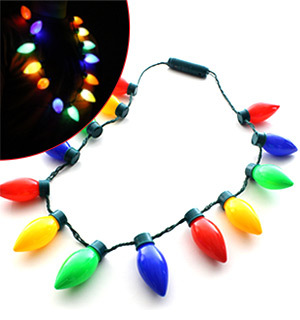 The light bulbs shine in colored lights, while the snowflakes are adorned with white lights. The beanie-style hats feature soft knit stitching and colorful poofball pom on top. Each festive hat measures 7 3/4" wide x 7" long. Each cozy scarf is designed with a pull-through design, a loop at one end for wrapping around the neck while the other end is completed with fringes. This unique twist to the scarf keeps it in place without any fuss. Each scarf is 4.5" wide and 40" long (including fringe). Fits adults and kids ages 8 and up. 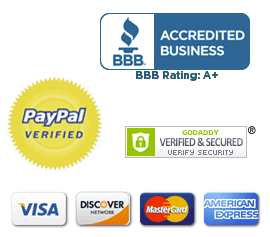 - Fits adults and kids ages 8 and up. These are so cute! Bought several and everyone loved them! Bought for adults and kids. Got these as fun Christmas presents. The quality was more than adequate for the price. They worked great, looked great and everyone loved them. My only regret was I didn’t get more because they were a lot of fun everyone wanted one. Both were hits with all of the female family members! I purchased the matching set in sky blue with the snowflakes. Absolutely adorable AND functional. Love it!! Got some sets of the scarfs and hats for my girls as they are often outside while it’s dark and visibility is poor. With the blinking lights they are much more visible to drivers in poorly lit parking lots and rural streets without sidewalks or lights. I do wish they were set up with easily replaceable batteries but I will be modifying with razor and fabric glue so batteries can be replaced without fabric unraveling. This was used as a steady or flashing light at a holiday party. The lights worked great, and helped us get to our car in the dark, wintery night. These hats were gifts for my grandchildren and they absolutely loved them! I also bought the snowflake. Looks good, fun, and its warm too! Great for all ages! My grandchildren were very excited when they saw the scarfs and hats that light up. They live in Oklahoma and can use them in the cold weather. It was a fun useful gift. love the colors on the hat and its very warm! A lot of people stop me and tell me how much they LIKE my hat.I think its a eye catcher myself. Im glad I bought it. I love them. I am always looking for novel seasonal items and this one really is spot on!!! bought three, one for myself and two for girlfriends. 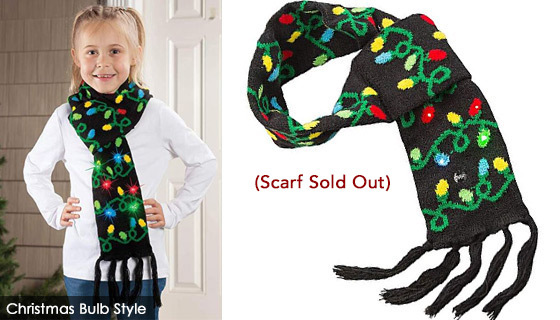 Everybody loved the loop end style, nice scarf for the price, have seen these in gift shops at a much higher price. Great holiday scarf! As advertised. 3 modes: On, Fast, and Slow. Would be better if not all lights at once. Maybe upgrade next year? Every product order I have received from Plustv have been an adventure in excitement. Every one of them worked as was described and amazed me. Purchased for children in the youth choir and youth ushers. Loved the quality and gifts. Adult leaders also loved them. Purchased a variety of styles. Itâ€™s beginning to look a lot like Christmas. Fun,comfy,and a great idea for holiday gift. Warm for sure but the best part is how the lights bring this to life! My granddaughter loves this set! Ordered 1 of each to use as pot sweetners for Bingo at Thanksgiving. My brother-in-law who is 6 foot 8 won the snowflake one. Everyone said you wont wear that, he teaches special needs kids and said yes I will, my kids will like it. Just got off the phone with my sister asking for your website, not only did the kids love them so did the other teachers. They all wanted to know where they could get one too! Just great, and great value! The scarfs were very hard to turn on and off but after several tries - they were great. I just love the hat & scarf and the lighting up ability is great for my nightly walks in my not so lighted community. You definitely can see me coming. The only thing I wished worked a bit better was the clicking mechanism to change and turn on an off the lights. Great buy and lots of fun so worth messing with that switch?? 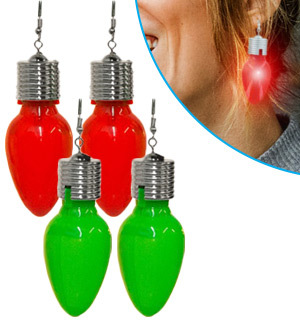 These are perfect for caroling. Just enough light. Hats are cute but donâ€™t know if the batteries will last till Christmas season? Any info from your staff? I SIMPLY LOVE THESE CAPS AND THE CUSTOMER SERVICE WAS SUPERB!!!!!!! Amazing Quality and Lights Work!! The quality of these hats exceeded my expectations, especially for the price. 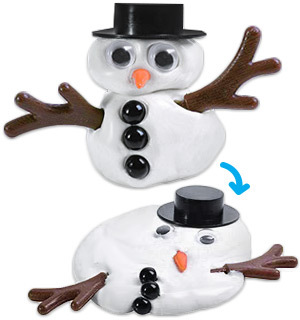 They are so cute I just ordered more, along with the light-up Christmas bulb necklaces. Thank you! !